We're rounding a corner on the preparation of our Doga series. Jess and Nikki B. have worked hard to prepare easy poses for all of us to practice, keeping beginners in mind even as she demonstrates some slightly more advanced versions of each pose. 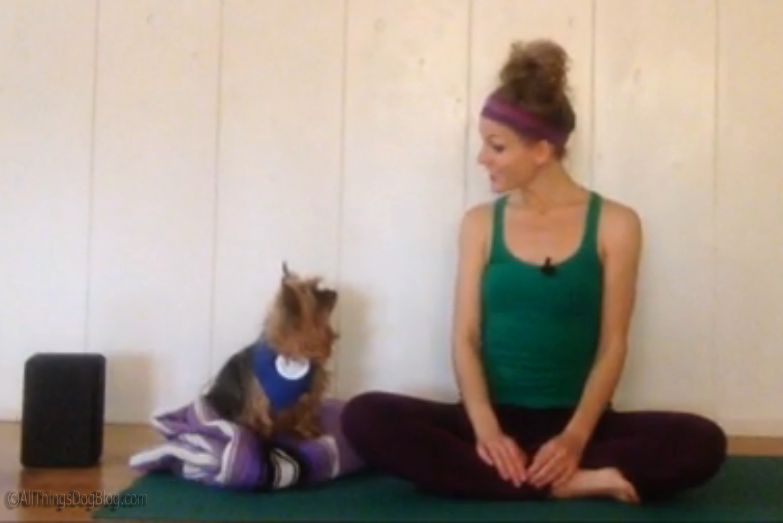 Just like your dog, Nikki B. has enjoyed spending time with Jess on the mat, while sometimes preferring not to participate. Doga practice is more about spending time together and bonding through that closeness, than it is about your dog participating. Never force her. Remember this when your Labrador just can't seem to balance on your back--LOL! Of course, each dog will have it's own unique version of participation. Some will wish to lie down under you when you are upright, while others may choose a position of distance as they wonder what the heck you're doing in something called a Downward Dog. Encourage your dog to join you while also allowing him to do this in whatever way makes him comfortable spending this time with you. You will both benefit. Enjoy the journey as you take your time, listening carefully to Jess's thorough instructions. There is no time limit to practicing these poses. Enjoy this time and do not rush. Even more importantly, All Things Dog Blog recommends that you visit both your physician and your dog's veterinarian before beginning any Yoga or Doga practice. While these poses we are presenting are very basic, please take it slow and easy. Remember that Yoga and Doga are all about balance of both effort and rest. Stop anytime a pose causes discomfort, and return to a pose that is comfortable and relaxing. At this point, as in any Doga practice, turn inward and focus on your breath, truly relaxing and enjoying the presence of your furry best friend. you a chance to connect the dots if you'd like to work up to doing the whole workout with Oliver and I. Eventually there will be an entire routine and we hope to make that available in some way--still working on that, so more later. For now, you'll easily be able to watch the poses--one by one--on our Youtube channel. Watch for our the first, very basic pose of the warm up, to appear on Saturday, March 15. I'll share a few tips later this week to prime your pump. Are you ready for Doga? @SlimDoggy: so are we! We're going to take this nice and slow to make it doable for everyone. Although the instructor will demonstrate more advanced options, the easy ones will be front and center. Most dogs will simply join their owner to watch. Some small ones may jump on board. It will be interesting to see the feedback. Be sure to let me know how your Lab responds. Thanks! Oh wow!!! How cool is this!!! Great idea! Great idea! Mom is always going off to yoga, but I think she'd like doing it with me. Looking forward to this! I've gotten really into Yoga lately. I wish I had space for a mini studio. I think it would help prevent Luna from being distracted. @Jessica Shipman, I hear ya! I actually considered the laundry room in order to keep my dog engaged, but thought better of it when we tried it. Next location will by our loft or the porch. I keep trying new spots and find benefits to each. Good luck!